This is one of our easy recipes for beginners that is delicious, refreshing and yet so nutritious. It features arugula leaves, cherry tomatoes, pine nuts, parmesan and avocado tossed with olive oil and wine vinegar. Make it for your family or guests to impress all. RecipeSavants.com This is one of our easy recipes for beginners that is delicious, refreshing and yet so nutritious. 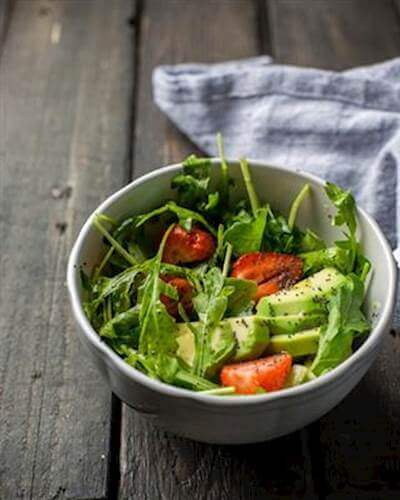 It features arugula leaves, cherry tomatoes, pine nuts, parmesan and avocado tossed with olive oil and wine vinegar. Make it for your family or guests to impress all. Smart Recipes, American Recipes, Dairy,Vegetables Recipes, Recipes Dairy,Vegetables American Arugula Salad PT15M Serves 4 Ingredients: 4 Cups Baby Arugula Leaves 1 Cup Cherry Tomatoes 0.25 Cup Pine Nuts 2 Tablespoons Olive Oil 1 Tablespoon Rice Vinegar 0.5 Teaspoon Salt & Freshly Ground Black Pepper 0.25 Cup Parmesan Cheese 1 Large Avocado In a large plastic bowl, add all ingredients except avocado. With a lid, cover the bowl and shake well to combine. Top with avocado slices and serve immediately.